Having been severely handicapped due to extreme weather conditions for most of the day on Monday, the India Air Force (IAF) used a window of opportunity on Tuesday with slightly better weather conditions and launched 04 MI-17V5 helicopters for flood rescue and relief operations in Gujarat and Rajasthan. A total of five helicopters have been pressed into service by the forces and several more being readied at the Air Force bases in Jamnagar, Phalodi and Jodhpur. 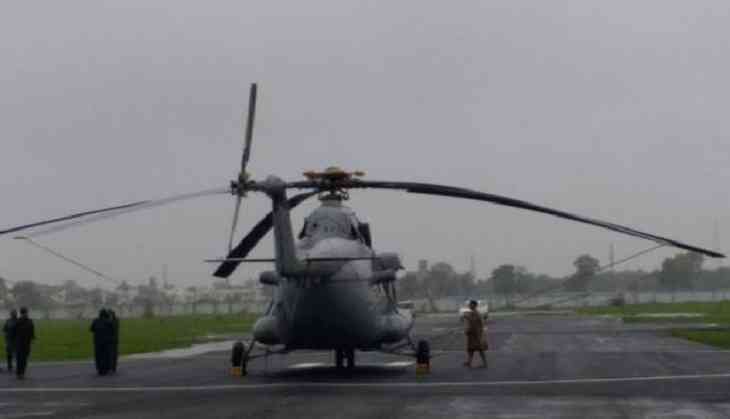 Two helicopters have taken off from Deesa for rescue and relief of the people stuck in the flood-hit regions in Banaskantha and Patan districts of Gujarat. Two more were deployed from Jodhpur for rescue and relief work in Jalore and Pali district of Rajasthan. One more is set to take off from the Deesa region. All these IAF bases and assets fall under the operational control of the Gandhinagar based Headquarters South Western Air Command. The states of Gujarat and Rajasthan were affected by severe flooding this month, with two people being killed in Rajasthan and forcing Gujarat to declare a high alert. Nearly twenty-five thousand people have been evacuated from the flood hit regions, with rescue work still in operation.